I just finished giving a speech at the western region meeting of the National Council for Marketing & Public Relations in Sedona, Arizona. 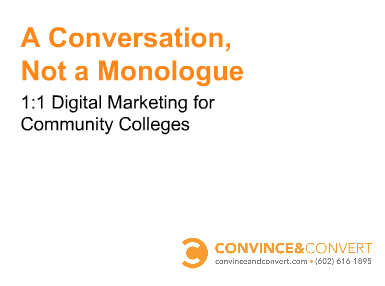 NCMPR is the association of community and technical college marketers. A really interesting group that needs to harness social media and work with prospective students on an individual, relevant, highly personal basis. While this presentation was specifically for NCMPR, there is a lot of material that will be valuable to anyone looking to launch and maintain a social media and digital marketing program for a mid-sized business or organization. – Lead acquisition is critical for colleges. Give users multiple call to action options. Comments are very much appreciated. Enjoy.